Kwantlen Polytechnic University has seen its share of controversy over the years, whether it’s full-on criminal activity within student groups or a lack of transparency within the university administration. Again and again, we’ve witnessed student dollars abused and allocated without consultation with those trusting that their money will be well-spent. At this point, scandal has become part of our reputation as a university, and this year alone The Runner has reported on more than a few of them. The first came in February when Codie Hindle, KPU’s manager of sport, recreation, and health, was charged with sexual interference with a minor. The incident in question allegedly took place in 2010, when Hindle was working at an overnight summer camp. He appeared in court on Feb. 20, and although the aftermath remains unknown to the public, there is currently an interim manager serving in his absence. In April, The Runner reported that the founder of the Kwantlen Public Interest Research Group was being sued by KPIRG for fraud. Allegedly, this individual made payments to himself without the knowledge of his coworkers, totalling approximately $112,000. Now he is believed to be in Vietnam, and he gave The Runner “no comment” when we asked him for an interview. To complicate things, since the KSA saw fit to withhold KPIRG’s funding, the research group feels that they will be unable to take their former employee to court to recover the money they allegedly lost. Around the same, KPU’s Board of Governors decided to increase tuition for international students by a whopping 15 per cent. You can read more about that in this issue of The Runner, but in short: The university doesn’t receive government money for enrolling international students, and with a recent influx of students from countries like China and India, KPU says that it will be unable to accommodate them without getting extra money to do so. Increasing tuition was their method of securing those funds, but students—international or domestic—were not consulted about this decision. None of this is the fault of students, at least not directly. It’s the responsibility of those in power to use that influence ethically, and to immediately own up if they fail to do so. However, a culture of student apathy at KPU sends the message to those in power that you can get away with anything here if you’re sneaky enough. If you’re careful, you might get a bunch of students who simply don’t care enough to protest your actions. That’s the message we have been sending since the very first “Reduce All Fees” scandal in 2006, when a slate of student politicians were believed to have misused about $2 million in student fees and ultimately got off scot-free. Play your cards right and you can take our money without consent or consequence. This last year has served as a testament to the fact that these occurrences won’t stop happening anytime soon. Shrugging off scandal will do nothing but attract more in the future. 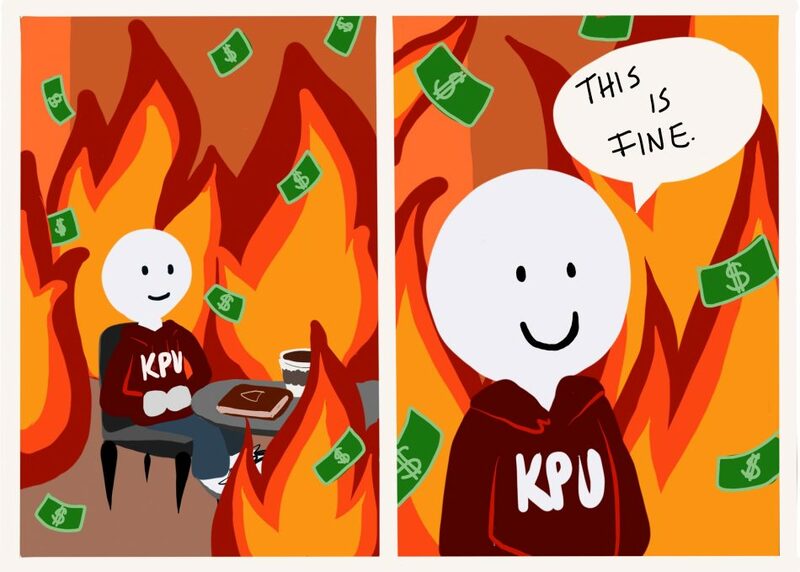 Our money and our dignity are on the line, and whether or not you’re proud to be a KPU student, you deserve to be treated with respect and honesty by institutions with million-dollar budgets and control over your education. Go to meetings for student groups. Read their minutes and releases. Stay up to date with what’s happening through your school newspaper. Most importantly, think hard about how much you care about what kind of institution you want to be a part of, what kind of student you want to be, and what kind of connotation you want to be associated with the degree you have on your resume when you leave.